Section headings and selected papers: Preface (R.L. Xu, A.T.Y. Lui). Opening address of the COSPAR president to the COSPAR Colloquium on Magnetospheric Research with Advanced Techniques (G. Haerendel). Magnetospheric Observation and Measurement Techniques. Investigation of a substorm following an extended interval of northward interplanetary magnetic field (A.T.Y Lui et al.). Energetic oxygen ion bursts in the distant magnetotail (Q.G. Zong, B. Wilken). High altitude electrostatic fields driving subauroral ion drifts (J.F. Lemaire et al.). Simulations of a spherical section electrostatic analyzer (J.P. Vilppola et al.). Active Experiments. Modification natural and manmade EM environment due to ionospheric plasma barrier transparency for groundbased transmitter emission (V.N. Oraevsky et al.). Asymmetry structure of the luminous neutral barium cloud in chemical release experiments (R.L. Xu, L. Li). Ti-C reaction in laboratory as a heating technique in space chemical release experiments (F. Wu et al.). Numerical Simulation and Theoretical Modeling. Ion beam velocity distributions in plasma sheet boundary layer (L.M. Zelenyi et al.). Generation mechanism of the field-aligned current system deduced from a 3-D MHD simulation of the solar wind-magnetosphere-ionosphere coupling (T. Tanaka). Computer simulation of the three-dimensional decay of thin collisionless current sheets (J. Büchner, J.-P. Kuska). A modulated whistler wave model on envelope soliton in CRIT II observation (D.Y. Wang et al.). Author index. List of participants. List of unpublished papers. Launches of several major magnetospheric research satellites (i.e., Polar, Wind, and Interball) set the scene for extensive multi-platform investigations of the Earth's plasma environment in the era of the International Solar-Terrestrial Physics Program. Exciting new results from this Program and the ongoing innovative advances to scientific instrumentation and spacecraft technology are vitally important for the international space community in preparing for future plans in the upcoming new millenium. This volume is a product of the COSPAR Colloquium held in Beijing on April 15-19, 1996 aimed to consolidate these achievements. 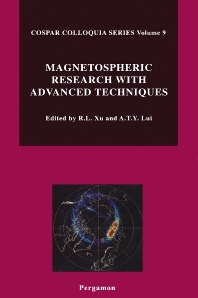 It contains state-of-the-art articles in the four areas of modern magnetospheric techniques, namely, (1) active experiment in space, (2) innovative measurement technique, (3) multi-point observation, and (4) numerical simulation and theoretical analysis. Researchers in the space community, both novices and experts, are expected to benefit from this collection of articles. For astronomers, astrophysicists and space scientists.